The permissions of fully initialized backend users are the result of the rights granted in their own user records and all the user groups they belong to. These grant access to backend modules, database tables and fields. Parts of the page tree and server file system. Access to work on individual pages based on the user id and group ids. A flexible and hierarchical configuration structure defined by TypoScript syntax. This typically describes "soft" permission settings and options for the user or group which can be used to customize the backend and individual modules. Access lists are defined at group-level. Usage of access lists for defining user rights is described in the Getting Started tutorial. The various access lists are described here for reference, with additional technical details, where necessary. Access list don't apply to admin users. As mentioned before, admin users have access to every single feature of the TYPO3 CMS backend. This is a list of submodules a user may be given access to. Access to a main module is implicit, as soon as a user has access to at least one of its submodules. Not all submodules appear in this list. It is possible to restrict a submodule to admin users only. This is the case, in particular, of all ADMIN TOOLS and SYSTEM modules, as well as the WEB > Template module. 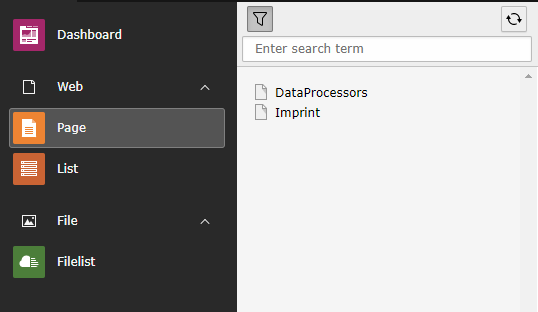 This is the only access list that is also available for definition at user-level. A list of all tables a user may be allowed to read in the backend. Again this in not a list of all tables in the database. Some tables are low level and never appear in the backend at all, even for admin users. Other tables are restricted to admin users and thus do not show up in the access list. Restricting a table to admin users only is done using the TCA property "adminOnly". All tables that are allowed for modification (see below) are also allowed for read access, so no need to select them in this list as well. This is exactly the same list of tables as before, but for granting modification rights. TYPO3 CMS defines a number of page types. A user can be restricted to access only some of them. For a full discussion on page types, please refer to the page types chapter. When defining column tables in TCA, it is possible to set the "exclude" property to "1". This ensures that the field is hidden to users by default. Access to it must be explicitly granted in this access list. When a field offers a list of options to select from, it is possible to tell TYPO3 CMS that access to these options is restricted and should be granted explicitly. Such fields and their values appear here. The related TCA property is "authMode". By default users can edit records regardless of what language they are assigned to. Using this list it is possible to restrict users to working only in selected languages. When a user is a member of more than one group, the access lists for the groups are "added" together. TYPO3 CMS natively supports two kinds of hierarchical tree structures: the page tree (typically visible in the WEB module) and the folder tree (typically visible in the FILE module). Each tree is generated based on the mount points configured for the current user. So a page tree is drawn from the DB Mounts which are one or more page ids telling the core from which "start page" to draw the tree(s). Likewise is the folder tree drawn based on filemounts configured for the user. A DB mount will appear only if the page permissions allow the user at least read access to the mounted page (and subpages). Otherwise nothing will appear at all! File Mounts are a little more difficult to set up, as they involve several steps. First of all, you need to have at least one File Storage. By default, you will always have one, pointing to the fileadmin directory. It is created by TYPO3 CMS upon installation. The fileadmin directory is the default place where TYPO3 CMS expects media resources to be located. It can be changed using the global configuration option $GLOBALS['TYPO3_CONF_VARS']['BE']['fileadminDir']. A File Storage is essentially defined by a File Driver and the path to which it points. "Admin" users do not need mount points. As always, they have access to every part of the installation. The owner and group of a page can be empty. 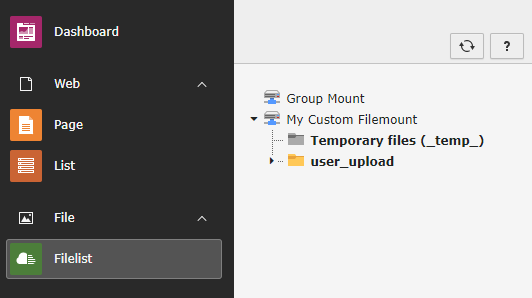 Nothing matches with an empty user/group (except "admin" users). See/Copy page and the page content. Change/Move the page, eg. change title, startdate, hidden flag. Delete the page and page content. Create new pages under the page. Here "Page content" means all records related to that page, except other pages. Editing permissions is described in details in the Getting Started Tutorial. A user must be "admin" or the owner of a page in order to edit its permissions. When a user creates new pages in TYPO3 CMS they will by default get the creating user as owner. The owner group will be set to the first listed user group configured for the users record (if any). These defaults can be changed through Page TSconfig. User TSconfig is a hierarchical configuration structure entered in plain text TypoScript. It can be used by all kinds of applications inside of TYPO3 CMS to retrieve customized settings for users which relates to a certain module or part. The options available are described in the document TSconfig .